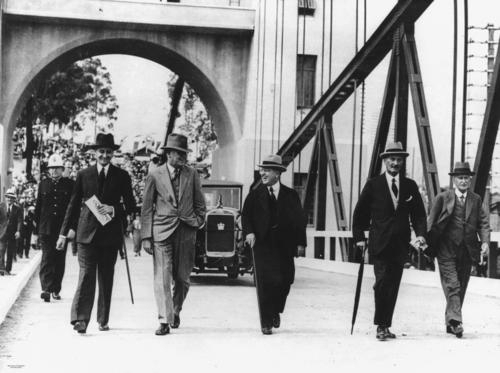 The Indooroopilly Toll Bridge, crossing the Brisbane river between Indooroopilly and Chelmer, was opened on this day seventy-five years ago. The Indooroopilly crossing was the long-held dream of Brisbane engineer and builder Walter Taylor. Here is a photograph of the opening that shows the official party, including the governor Sir Leslie Orme Wilson, walking across the bridge after the opening ceremony. The bridge's designer and constructor, Walter Taylor, is on the far right. Walter Taylor had approached the various authorities as far back as 1924 for approval to bridge the river at Indooroopilly, but hadn't received the go-ahead. Then, in 1929, he presented a plan to the Brisbane City Council that used surplus steel cables from the Sydney Harbour Bridge, and his plans were finally approved. Click here for technical information on the bridge, held at a German engineering site - there are a bunch of photographs too. 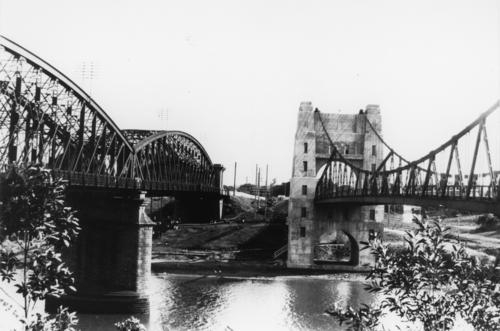 The point chosen for the crossing was next to the Albert Railway Bridge, which had been reconstructed in 1894 after an earlier version had been wrecked in the 1893 floods, and which provided the rail link between Brisbane and Ipswich. Like the Hornibrook Bridge that had been opened just a few months earlier down at Redcliffe, the Indooroopilly Bridge was built as a private venture, and it ran as a toll bridge for almost thirty years after its opening in order to repay the construction company of which Taylor was a director. I can remember my father muttering "How many times do we have to pay for this bloody bridge!" as we crossed it in his employer's little Morris utility that he drove to and from his work in the sixties. The toll was removed when the bridge was taken over by the Brisbane City Council in 1965. My recent photo of the Indooroopilly side of the bridge is above. The towers at each end contained accommodation that was originally provided for the toll collectors, and it was not uncommon to see washing fluttering outside on the balconies. People lived there until recently - a couple of years ago, rescue workers were called to remove an ill resident of the apartments who was unable to exit the building because of his size. Take a look at this quaint YouTube video of the life of a toll collector on this bridge. Walter Taylor died in 1955, and in 1956 the bridge was renamed the Walter Taylor Bridge in his memory. I love the Walter Taylor Bridge. I've always wanted to live there. I grew up in Longman Tce about 200 m away from the bridge, I remember the toll keepers and my Dad remembered Mr McDougall when I showed him this clip 2 years ago. I always wanted to live in there too! I got the chance to go in to the flat at the Chelmer end in 87 when I was riding home across the bridge and saw two very attractive young ladies moving furniture out of there. I offered to help and thus after 30 yrs got to see inside. Wonderful high ceilings and spacious. The girls told me that there was a ladder to the very top so I climbed that and stood on the very top of the tower (left side heading to Indooroopilly) and it was a thrill, no railings and small area, grat view. Walter Taylor trivia- there is a metal door on the side of the wall on Chelmer side. Dad always told us that during WW2 it was filled with dynamite to blow the bridge if the Japanese forces made it that far south! Wonder if anyone still has the key? I wonder if you by any chance have the maximum load detail of this bridge? I try nearly everywhere but just get its details. Or can you please direct me to any place that could provide such information? Sorry Tony. None of the information I have mentions the maximum load. Seeing the bridge is now owned by the Brisbane City Council, perhaps you might try contacting them. One of their engineers should have this information. I have lots of memories of this bridge, ALWAYS wanted to see inside when I was younger! Now im no longer in Qld but it was interesting to read about the obese man who was craned out, that would have been a fascinating site! A Brisbane City Council newsletter noted the bridge "weighs 29,300 tonnes"... perhaps you could estimate the load from that? Thoroughly enjoyed the trip down memory lane. In the 60's my dad would acknowledge the signs along meandering Whitton? Terrace, which hugged the bridge and river for a way. Does anyone know the name of the obese man lifted out by crane in 2009 and whatever happened to him? His name is Glen Green. He lived there with is brother , Brice. He is a wonder man as is doing well.